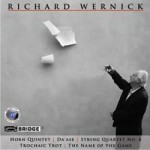 Richard Wernick (b. Boston, Mass, 1934), on the evidence of this program, writes such serious-sounding music that listeners may be apt to take him too seriously in the moments when he’s being playful – as most composers do from time to time. The playfulness comes out in at least two places here, both guitar pieces commissioned and played by David Starobin. Da’ase is the name for a traditional Yemenite wedding dance, constructed in units of seven beats. 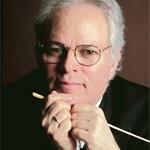 Being a modern composer, Wernick can’t let the old form be without tinkering a bit with it, mostly in the way of abstraction and increased syncopation. (Don’t try doing this dance at home!) Trochaic Trot provides further challenges to Starobin’s virtuosity in that Wernick bases it on the three-syllable poetic foot of that name, with emphasis on the first syllable, modifying rhythm and motif throughout to keep the performer continually alert. The Quintet for French Horn and String Quartet posed problems of a different sort. When he was first commissioned by Emily Fine to write the work for her favorite instrument, Wernick researched the literature to see what other composers had done. The answer: astonishingly little. The difficulties involved in blending the horn with a string quartet in terms of volume and timbre were undoubtedly a main deterrent. (There’s a horn quartet by Mozart, who fudged by including two violas and one violin, instead of vice versa, in the string quartet, and that’s about it.) Wernick solved the problem by creating spaces for the horn within the standard texture of the string quartet, the horn playing in its middle register when the strings are very high or very low, while also employing its own highest and lowest registers, making for a five-part texture. As the work progresses, the horn, heedless of danger, draws closer to the strings while still maintaining its own distinctive character. The performers in this instance, hornist Myron Bloom and the Juilliard String Quartet (Joel Smirnoff, Ronald Copes, Samuel Rhodes, and Joel Krosnick) do a splendid job characterizing this work in three movements: 1 Fast, bright; 2 Spectral, disembodied, and 3 Skitterish. The second movement is as eerie-sounding as its subtitle. The third gives way to more lyrical, and pensive, music in the second half. Quartet No. 6 is the gravest, most serious work on the program, owing largely to its commission by Jacqueline and Bert Harmon of the Jerusalem String Quartet in memory of their cousin Henry Levy (1908-1995), who devoted his life to relocating displaced Jewish victims of oppression in all the world’s hot spots and despised totalitarianism in all its forms. Written in one densely packed movement, the entire work is generated from the opening motif stated by unison violins and viola, and thus possesses an unusual thematic and emotional unity. The Colorado String Quartet, consisting of Julie Rosenfeld and D. Lydia Redding, violins; Marka Gustavsson, viola; and Diane Chaplin, cello, give their very best in this performance. The Name of the Game, for solo guitar and eleven players, once again features the artistry of David Starobin, together with members of the International Contemporary Ensemble on flute, clarinet, bassoon, horn, violin, viola, cello, bass, and harp, with two percussionists, all conducted by Cliff Colnot. It’s in two movements, playfully entitled “The Name is the Game” and “The Game is the Name,” but is not in the form of a palindrome for all that. Much of Wernick’s intellectual play consists of finding a musical motto for the artist’s name (It would have been much easier if he’d been named BACH or D. SCHostakovich instead of Starobin). In the end, Wernick employed the musically useful letters in the guitarist’s name, D, A, D, E-flat, B, A, B-flat, where S=German “Es” = E-flat, T=”Ti”=B natural, and B=German B-flat. 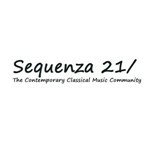 In this work, slow music evolves into fast, and vice versa, and scherzando passages become more introspective. Actually, since the first movement is really two movements, fast and slow, and the second ends in a coda that becomes more ruminating in character as the guitar takes the lead, we really have a work in three or four movements instead of just two. The ending is a long diminuendo into silence.